Link to South Florida Climate Plots and Data (Miami (MIA), Fort Lauderdale (FLL), West Palm Beach (PBI) and Naples (APF)). 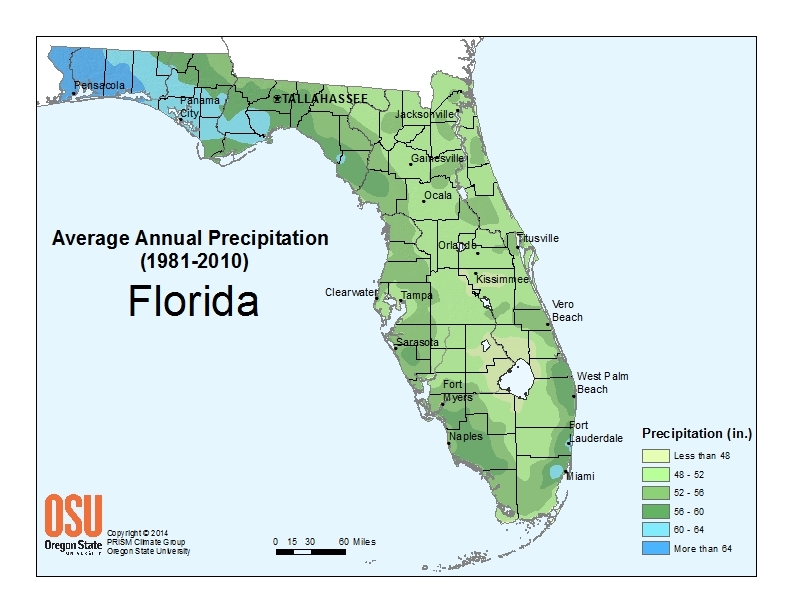 South Florida winters are usually dry and warm during La Niña conditions, while El Niño conditions usually bring cool and wet conditions to our region. ENSO effects on South Florida are rather minimal during the summer months, with the exception of tropical cyclone activity in the Atlantic Basin. You can also obtain historical distributions of 3-month temperature and precipitation associated with 3 different ENSO categories - El Nino, La Nina, and Neutral events for a climate division. For South Florida, please click on number 68. Here is the Average possibility of Freeze and Hard Freeze for Florida for the La Niña, Neutral and El Niño phases of ENSO. While ENSO (El Niño-Southern Oscillation) plays a key role in winter weather conditions over most of the globe, including South Florida, other regional oscillations can also influence winter temperatures and precipitation over South Florida. One of these oscillations is the North Atlantic Oscillation, or NAO. When the wintertime NAO is in a positive phase, South Florida typically experiences near to above normal temperatures due to the jet stream being located far to the north over the Great Lakes and Northeast United States, which allows for the Atlantic subtropical high to position itself near or over the Southeastern United States. This usually causes east and southeast winds from the warm Atlantic waters to blow across South Florida, with the subtropical high blocking the southward movement of any Arctic or Polar air masses. When the wintertime NAO is in a negative phase, South Florida usually has below normal temperatures due to the jet stream shifting farther to the south over the southeastern United States. This jet stream configuration allows for cold air outbreaks of Arctic or Polar origin to plunge south and deep into the Southeast United States, including Florida. A strong NAO phase can either override or enhance the overlying ENSO pattern. An example of this was the winter of 2010 when a strongly negative NAO phased with a strong El Niño to produce colder and wetter than normal conditions across South Florida. The Arctic Oscillation (AO) is a climate index of the state of the atmospheric circulation over the Arctic. It consists of a negative phase, featuring below average geopotential heights, which are also referred to as negative geopotential height anomalies, and a positive phase in which the opposite is true. In the negative phase, the polar low pressure system (also known as the polar vortex) over the Arctic is weaker, which results in weaker upper level winds (the westerlies). The result of the weaker westerlies is that cold, Arctic air is able to push farther south into the U.S., while the storm track also remains farther south. The opposite is true when the AO is positive: the polar circulation is stronger which forces cold air and storms to remain farther north. The Arctic Oscillation often shares phase with the North Atlantic Oscillation (NAO), and its phases directly correlate with the phases of the NAO concerning implications on weather across the U.S.
Weak El Nino Conditions will develop over the Pacific waters this winter. This usually means that the affects on South Florida is small allowing for cold fronts to still work down into South Florida. At this time...the long range models are showing that the water temperatures in the Central Pacfic Ocean will be in the weak El Nino range between 0.5C and 1.0C. This usually means that the rainfall will be a little bit above average and temperatures will be near normal outside of any affects from the Arctic Oscillation (AO) and the North American Oscillation (NAO). Here are the 3 month outlooks from the CPC for the winter months of 2015 for the temperature and precipitation. 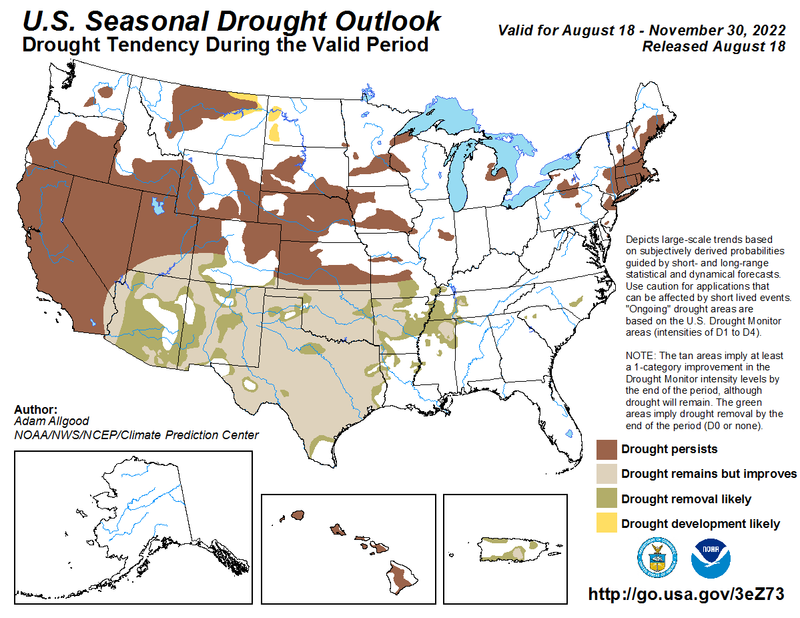 Here is a link to the current drought status cross South Florida. Southeast Climate Center - This is a page that the Southeast Climatologist Office put together to see the different parameters such as rainfall, Average Min Temperature, and Average Max Temperature the relationship of neutral, below normal, or above normal Enso conditions in the Central Pacfic Waters. 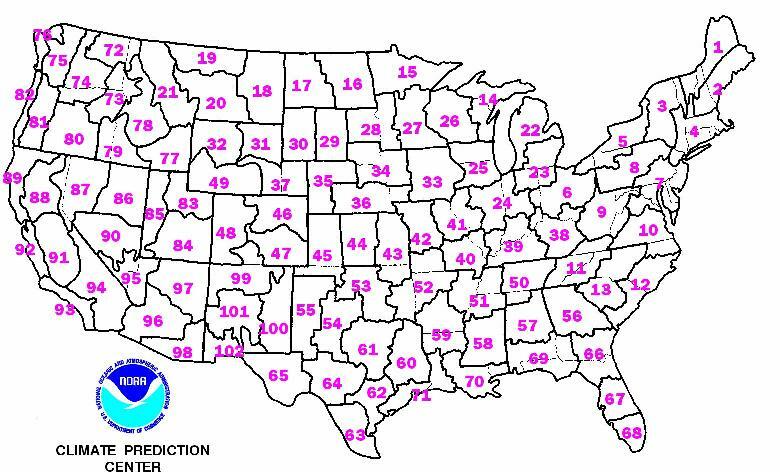 The information is broken down by county by county level of each state, and it represents a relative frequency interpretation given different climate states like neutral, El Nino, La Nina, and all years combined.